Yeah, I said it. Hella hot! 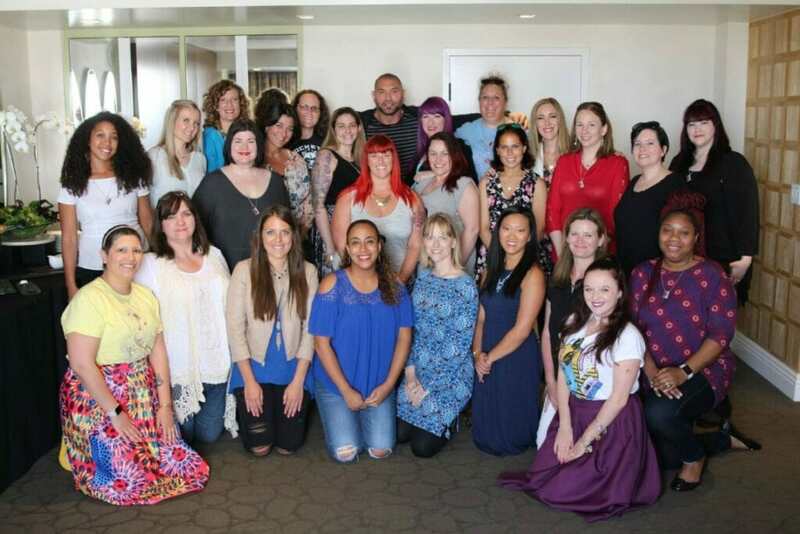 Here’s the thing about Dave Bautista – he’s a really a calm and chill kind of guy. Not like Drax at all, in fact! Now that Dave and I are fast buddies after our quick sit down to discuss his latest movie, Guardians of the Galaxy Vol. 2, I can tell you that this man is taking life day-by-day and living in the moment. None of this chaos is going to his head. He knows what matters – and that’s family… not fame. Ok, well maybe he’s a little like Drax after all. This is the second time I sat down with Dave and he gave off the same kind of vibe. Super chill and grateful. Would he do the press tours if they weren’t required? Maybe. Do magazine front covers and red carpets appeal to him? I’m not so sure. If I had to guess, I’d say that Dave’s job doesn’t define him, but he loves what he does. However, he is much more than his work. But Dave IS a Guardian of the Galaxy and everyone in the room absolutely adored him and was so thankful for the time to speak with him. We took every ounce of what he allowed us to see. Very reserved and held back. Humble. Bigger than life but don’t let that fool you. This man is soft spoken and easy. I don’t know where he lives or what he does during his downtime, but I sensed that his happy place remains in the quiet and the now with his wife, family and maybe even some pets. Drax – on the other hand – is loud and hilarious, a scene stealer and… one of my favorites in Vol 2. He also made me cry the ugly cry during one of his scenes. I’m talking sobbing. Look out for it – him and Mantis. Ugh. I was dead on the floor during the premiere. Snot running down my face. He is remembering something and she is holding onto him to feel his memory. That’s all I will say. Bring tissues and some aspirin. 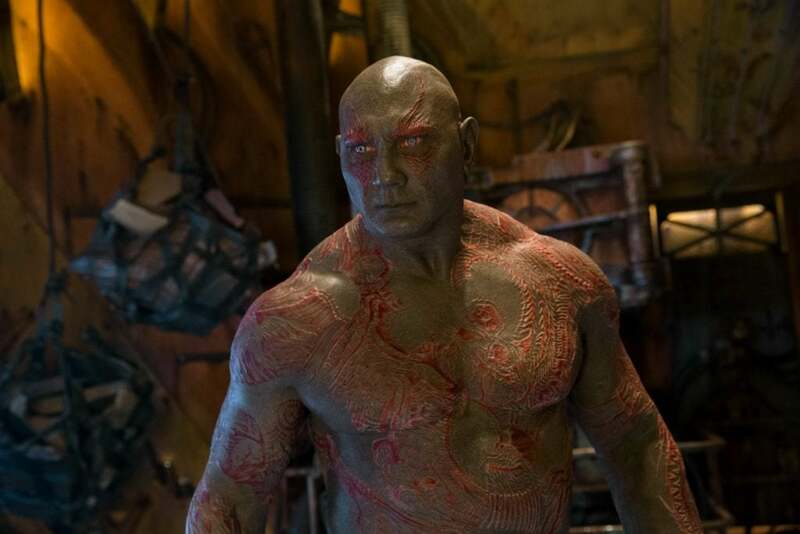 But “funny” Drax is a bit different than “comic book” Drax and when Dave Bautista read the script for the very first time, he wasn’t sure how he felt about his character veering so far away from the original. When I first read the script, I wasn’t crazy about it. And you have to — this is my initial reaction, when I usually get a script I go over my dialogue first. So, I read over my dialogue and for one I was expecting them to go a different direction with Drax. I thought he was gonna be more of the “destroyer.” I thought he was gonna be a more comic book Drax and then I realized they were going — they were digging more into the funny bits. And I don’t find myself funny at all, so when I was reading these lines I was like they’re not funny. I just didn’t really get ‘em and I read the script, and I thought, wow, this is really a great script. It’s deep. It’s emotional, but I still was a little bit disappointed about my part. And then the first day we did our table read, I realized it was hysterical. And then I just started — I just had a completely different outlook on it as a whole. I mean, I don’t want to hype him up because I hate when people do that, but he really is flipping funny in Guardians of the Galaxy Vol. 2. A straight up scene stealer! Yes, I called him that again. I’ve mentioned before that I liked Vol. 2 more than the original… and I stand by that! Guess who else likes the second one more than the first? Uh huh. That’s right – Dave Bautista! I think it’s beautiful. I like it’s better than the first film. It’s weird. It’s one of those things- I feel like the more and more we get into film, the more I am sucked into it and there were certain beats I just sniffled up. I just get so emotionally like invested in this film. And, you know, I didn’t — I felt that the first one I thought was fun and exciting and some parts were very emotional, but not like this one. I felt like I was just totally absorbed in this film. Ever wonder how an actor feels about seeing himself on a film he is in? I always DO. Dave does NOT like seeing himself on the big screen. He literally cringes. I just cringe. I just don’t like watching myself on film. It’s just uncomfortable. And last night at the premiere I just — every time I was on the screen like and I knew I was gonna say something – I just kinda put my head down and just try to get through it. I’m just uncomfortable with it. I’m still judging myself, and it’s just something that I — yeah, it’s hard for me to do. Even when we were filming and we watched playbacks, everybody knows that I don’t like ‘em. You know, they’d call Zoë, call Chris to watch the playbacks. They don’t call me to watch playbacks, ’cause they know I won’t sit there and watch it. Interesting, right? I mean – in the end – if it’s a good scene then it’s a good scene. The actor doesn’t really need to see it. That’s what the director is there to determine. Dave is in good hands on Guardians of the Galaxy! No, not — and if I can have input on it, I would say no, because it’s the root of who Drax is. Drax lives for his heartbreak. You know, he’s just too heartbreaking. I don’t think he’ll ever have a romantic connection with anyone. From your mouth, Dave! From your mouth! 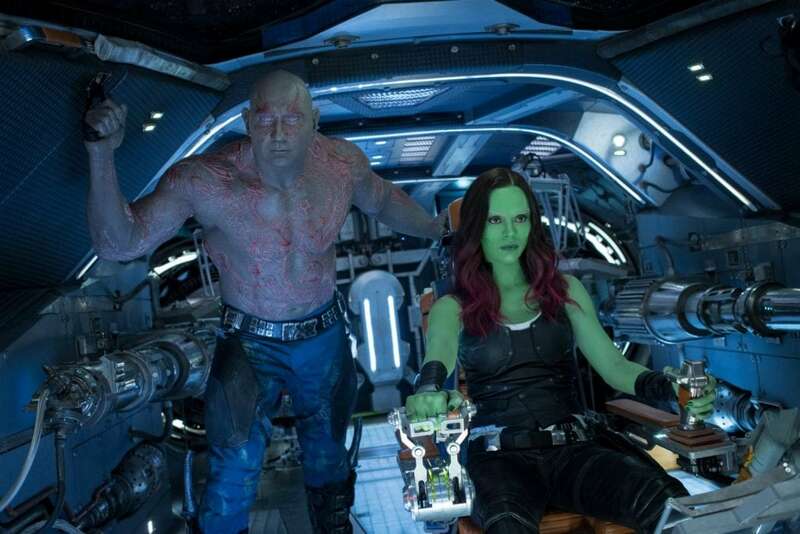 I mean, not that I want Drax to suffer for the rest of his life – but I think that Drax has loved. He loves already. And his whole life is based on living in that love. I mean- I want him to heal from the hurt, of course. To find peace… but through love from friendship which is exactly what he is doing. 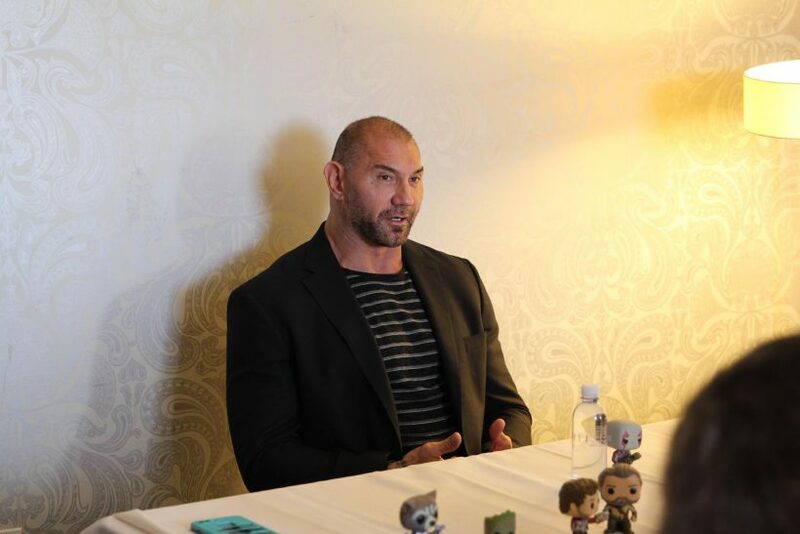 We even asked Mr. Dave Bautista about the fffffuuuuutttttuuuurrrrreeeee. What did he want for his character? What did he hope would happen in Guardians of the Galaxy Vol. 3? If I had some input in it, what I’d really love is for people to have a visual, you know, a face, a name to put with a face. And I’d love if they would actually show Drax’s family. Some of the race of beings that he comes from. 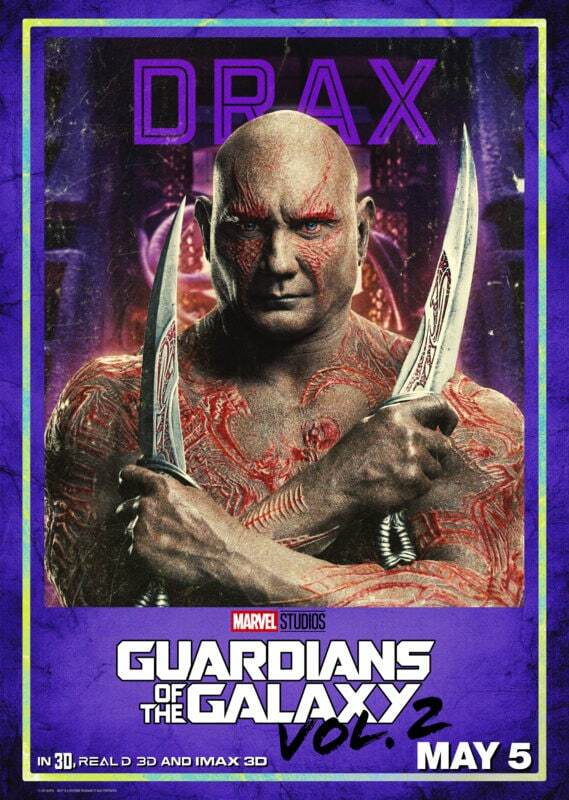 You know, I’d like to see more Drax, more people with different tattoos and just that race of people. 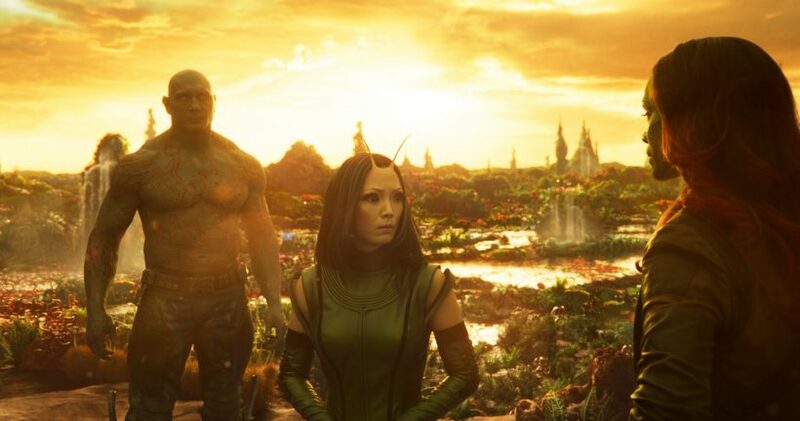 But I’d really think it would be great if the audience could just have a visual of Drax’s family. I think that would be amazing. A perfect idea in fact! I would love to see a movie come out where we could see all the origin stories of everyone involved! James – are you reading this??? *Disney invited me to attend the Guardians of the Galaxy 2 premiere and to interview Dave Bautista. All opinions are my own.